Disability News Service, Resources, Diversity, Americans with Disabilities Act; Local and National. CHICAGO, IL (September 3, 2014)–3Arts announced today the creation of two 3Arts Fellowships at the University of Illinois at Chicago (UIC), unprecedented artist residencies focused on supporting the creation of new work by local artists with disabilities who are actively engaged in raising awareness about disability culture on and off campus. For the inaugural 2014/15 year, two past 3Arts Award recipients were invited to apply; following this pilot, the process will be opened to qualifying artists in the Chicago metropolitan area. The inaugural fellowship recipients, 3Arts Awardees Robert Schleifer (theater and performing arts) and Riva Lehrer (visual arts), will be given full access to the resources available on the UIC campus, support in making new work, and paid opportunities to engage with students and faculty, and through public programming in organized critiques, studio visits, public forums, and workshops. Schleifer is currently working to translate Yasmina Reza’s Art completely into American Sign Language, involving the UIC community in workshops this fall. The new play will be titledArt in ASL. Lehrer’s fellowship, beginning in February 2015, will explore issues of portraiture and power in a series of collaborative portraits. UIC plans to utilize the fellowships to create space for more interdisciplinary artistic approaches to art, and study of the intersection of research methods and artistic processes—such as the connection between the medical humanities and art. “We hope that these fellowships will shed light on different models of creative expression, focusing on questions of accessibility and educating the campus and public more on disability art, disability culture, and inclusive learning,” said UIC Department of Disability and Human Development Associate Professor Carrie Sandahl. Driven by the belief that the vitality and creative spirit of Chicago is reliant upon a diverse spectrum of artistic voices, 3Arts is a nonprofit organization that advocates for Chicago’s women artists, artists of color, and artists with disabilities who work in the performing (dance, music and theater), teaching and visual arts. By providing cash awards, project funding, residency fellowships, professional development and promotion, 3Arts helps artists take risks, experiment and focus on their creative process. In the past six years, 3Arts has distributed nearly $1.5 million to Chicago's women artists, artists of color, and artists with disabilities. For more information on 3Arts, please visit www.3arts.org. A major research university in the heart of one of the world's greatest cities, UIC provides a world-class education for its students. It is committed to creating and disseminating new knowledge as a university of growing national and international stature. The largest university in the Chicago area, UIC has 27,580 students, 15 colleges—including the nation's largest medical school—and annual research expenditures exceeding $335 million. UIC operates the state's major public medical center and serves as the principal educator of Illinois' physicians, dentists, pharmacists, nurses and other health-care professionals. A truly global institution, more than a third of UIC students speak English as a second language. UIC's student body—approximately 61 percent undergraduate and 39 percent graduate and professional—is recognized as one of the nation's most diverse. For more information on UIC, please visit www.uic.edu. Make the 'Disability Vote' in Illinois Heard! Chicago: No-Fee City Vehicle Stickers Program for persons with a qualifying disability. We would like to know what information, resources, questions you might have. Is there more disability related information you would like for us to post. What different types of disabilities is more information being searched for. Are there specific Federal /State regulations more of interest? We are always trying to post diverse information that is helpful for the majority of our readers. This non for profit website contains material which has not always been specifically authorized by the copyright owner for usage. For this reason, we are making such material available in our efforts to advance understanding of disability related information, political, human rights, economic, democratic, scentific, social justice, etc. We believe this constitutes "fair use" of any such copyrighted material as provided for in section 107 of the US Copyright Law. In accordance with Title 17 U.S.C. Section 107, the material on this site is distributed without profit to those who have expressed interest in receiving the included information for research, and educational purpose. Disclamer: The publication of any and all content e.g., articles, reports, editorials, commentary, opinions, as well as graphics and/or images and/or videos on this website does not constitute sanction or aquiescence of said content unless specified; it is solely for informational purposes. 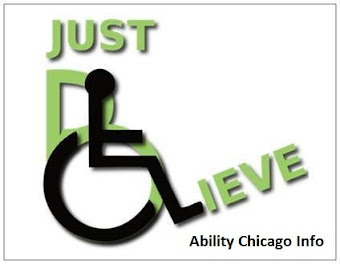 Ability Chicago Info Blog purpose is to share deverse information of disability related issues. For that reason we do not endorse any posts, will post different opinions on any subject when available, and from responsible sources. Please feel free to submit any concerns, and information to be considered for posting. Thank You. Ability Chicago Info: 2011 - 2018. Simple theme. Theme images by gaffera. Powered by Blogger.